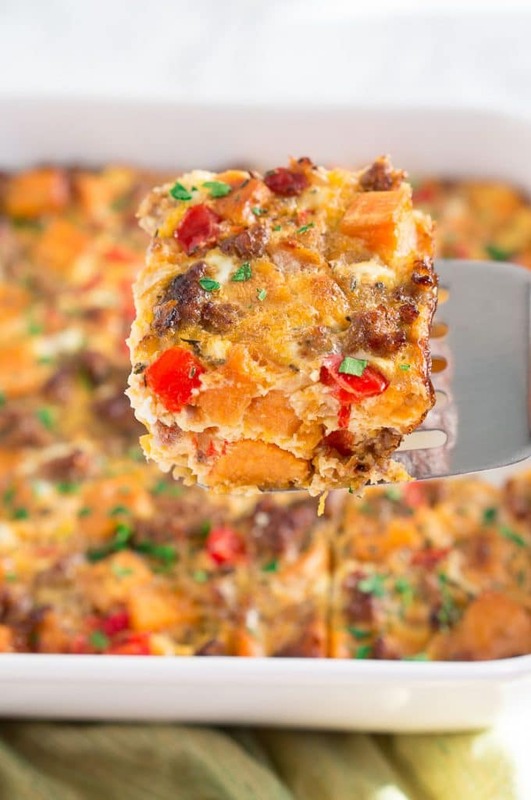 Sweet Potato Sausage and Egg Breakfast Casserole – a healthy breakfast casserole perfect for a large breakfast or brunch with your whole family. 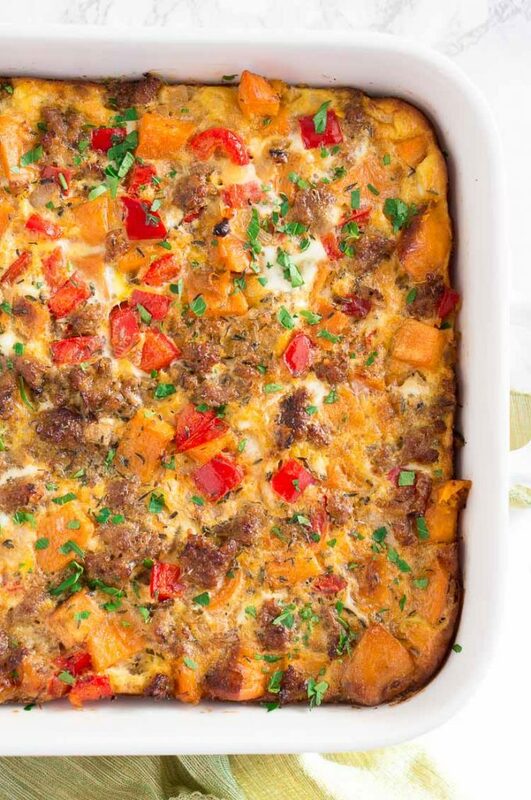 If you are looking for a crowd-pleasing breakfast recipe that doesn’t require you to get up at the crack of dawn, this sweet potato sausage and egg breakfast casserole is perfect for you! This overnight egg breakfast casserole is great for an Easter or Christmas brunch, or anytime you have family in town. It’s a great breakfast/brunch recipe that everyone will love. I love that it’s so hands-off in the morning if you have prepped all your veggies the night before. And leftovers are so good, they reheat really well and can last several days in the fridge. Leftovers make for a great lunch too, and they keep you full thanks to all the protein from the eggs and sausage. 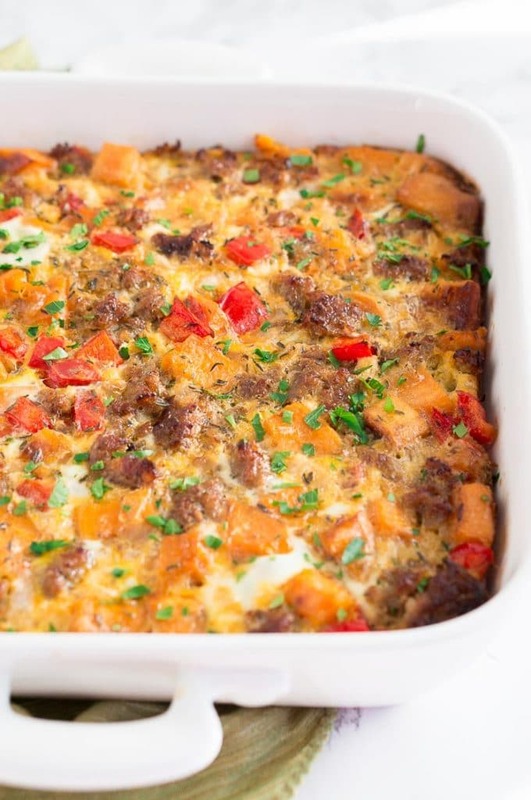 This breakfast casserole has become one of my favorite weekend breakfasts! 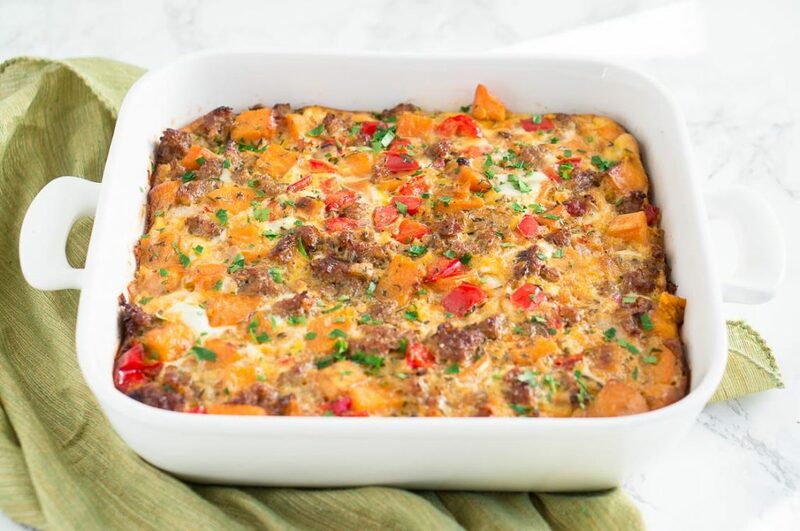 It is packed with veggies and eggs but it also has a delicious sweet/spicy flavor because of the sweet potatoes and the mild Italian sausage I use. 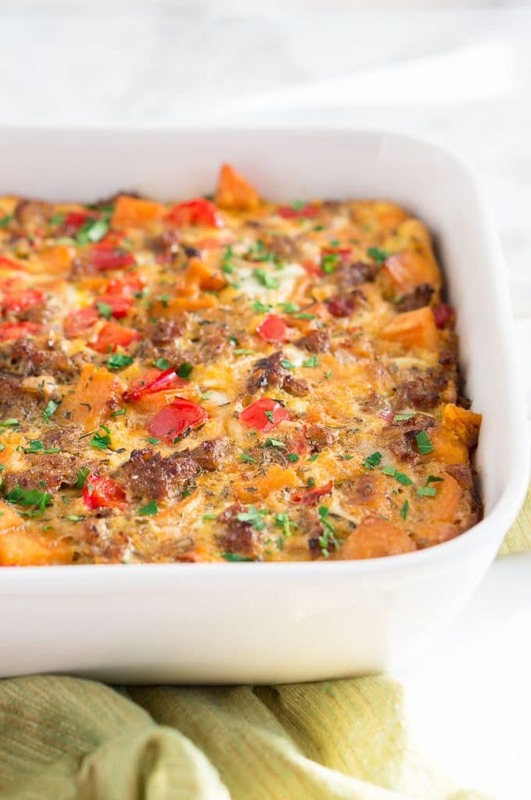 I also love that it’s a healthy breakfast casserole – it’s naturally Paleo, Whole30, gluten-free, dairy-free and loaded with nutrients from all the vegetables. 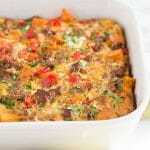 This Sausage Egg Breakfast casserole is delicious for breakfast or brunch for a large family. You can save yourself some time in the morning by prepping the egg breakfast casserole the night before and storing it in the fridge overnight. Then in the morning you can only add the scrambled eggs and pour it over the casserole and bake the sweet potato egg bake in the oven. You can have a delicious breakfast for your whole family in about 30 minutes. It’s very hands-off and you can use the time to get a pot of coffee going. Yes, you can freeze the sausage casserole – either before or after cooking it. If you freeze it before you cook it, omit adding the eggs to the casserole, and freeze it for up to 3 months. When you are ready to cook it, place it in the fridge about 24 hours before you plan to cook it. After it has thawed in the fridge, add the eggs to the casserole dish, and bake in a preheated oven at 375 F for about 25 minutes according to the recipe’s instructions. If you decide to freeze the casserole after you cook it, let it cool completely, cover it with plastic wrap and foil, and freeze it. Freeze up to 3 months. Then thaw it completely in the fridge, cover it with foil and reheat it in the oven at 350 F for about 20 minutes or until warmed through in the center. These sweet potato breakfast recipes are amazing! Give them a try! Heat oil in a skillet over medium-high heat. Add sweet potatoes to the skillet and cover with a lid. Cook for about 8 minutes, stirring occasionally until the sweet potatoes are almost tender. Add onion and red bell pepper, season with salt & black pepper, and cook until vegetables are tender (about 3 more minutes). Transfer the vegetables to a casserole dish. Add sausage to the skillet and cook over medium-high heat until browned (about 5 minutes), crumbling the sausage with a spoon as it cooks. Transfer to the casserole dish. In a medium bowl, whisk the eggs, almond milk, and spices. Pour over the vegetables & sausage mixture in the casserole dish, and stir to combine. Bake the breakfast casserole covered with an aluminum foil in a 375 F preheated oven for 20 minutes. Then remove the aluminum foil and bake for an additional 15 minutes until the top of the potatoes begins to brown. Remove and let the casserole rest for 5 minutes. Sprinkle with green onions and serve! love sweet potato, this looks like the perfect breakfast! Thanks, Amy! yes, it is very flavorful and so delicious! Really liked this one — however, we doubled the eggs and almond milk to make it fluffier. The sweet of the sweet potatoes mixed nicely with the savory of the sausage. I also think you can do all the stove top work the night before, to simplify the work in the morning. Thanks, Ivan! Glad you liked it!! Yes, it sure gives you a head start of you do the stove top work the night before. This recipe was a healthy winner for me and my Valentine!! Thank you! Hi Christina! I am glad you and your Valentine enjoyed it! 🙂 Thanks for stopping by! How many does this serve? I will be hosting a retreat of 12 women and want to make this!! Made tbis for Easter brunch. It was so delicous, everyone had seconds. It served 5 adults. Kick myself for not taking a photo because it looked fabulous coming out of the oven. I used a turkey cranberry sausage that is made locally. Can I make and cook the night before and just reheat or microvave the next morning? I used Frozen Sweet Potato Tots, cut in the middle to make 2 rounds from each. After the vegetables are sauteed, add the sweet potato tots & toss until warmed. I save a dozen or so to put on the top surface after baking, to brown. I also chopped up fresh bacon from a 1/2 farm hog, Frued the bacon bits and sprinkled on top after removing fail. We served eith an accompaniment of fresh tomato, onion, avocado, cilantro salsa. Delicious! I made this on my wife’s birthday to accommodate her Whole 30 diet. She loved it so much I made it again on Mother’s Day. And then I made it at the lake house for my entire family over Memorial Day weekend. Now my daughter is on the Whole 30 diet and asked me to make it for her last night so it would be ready after her dance recital. More than half the casserole was gone before breakfast this morning! The only change I made was subbing orange peppers for the red peppers. Just a personal preference as I think the sweetness of the orange peppers complements the sweet potatoes well. And the colors match. Also, last night I tried it with turkey sausage (the first three times were all with pork sausage.) Honestly, we couldn’t even tell the difference, so if you’re looking to make a healthy recipe even healthier, you won’t be disappointed. Thanks to this website for making me look like a hero. i want to make this and freeze immediately and unthaw it on Sunday to use for The week. Can that be done? After two to three hours in the fridge, unwrap the casserole. Cover it lightly and return it to the refrigerator to finish thawing. Unwrapping at this stage allows condensation to evaporate, preventing it from becoming soggy. This recipe was delicious. I will definitely make it again. I added an extra egg and more almond milk. There were four adults and we ate it ALL, oops. I served it with salsa, full fat sour cream, cheese and avocado. Yummy. I’m making this for Easter brunch, but I’m vegetarian. If I’m omitting the sausage, is there anything else you would recommend adding? I don’t do soy. Thanks! 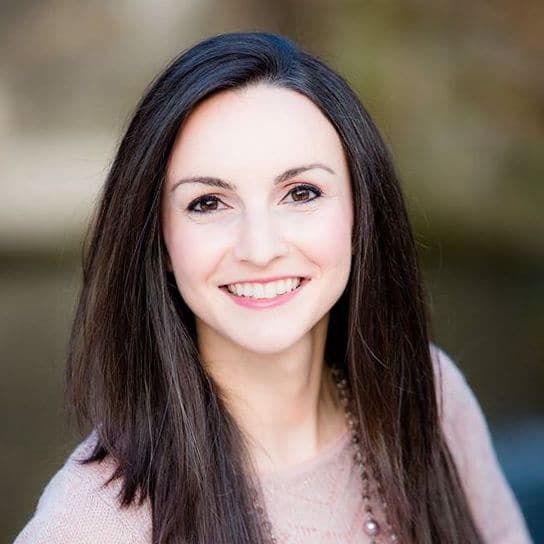 Hi Meredith, I am not very familiar with all vegetarian substitutes but some suggestions that come to mind are: cooked lentils, mushrooms, canned kidney beans, and gluten-free vegan meat found at the grocery stores.